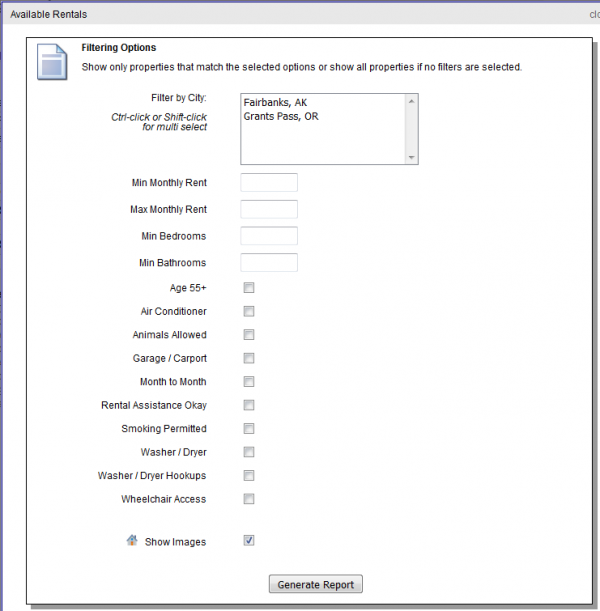 Rentec Direct offers the ability to print out an available property report with filtering for criteria such as maximum rent and the number of bedrooms and bathrooms. The report also includes a checklist for features like wheelchair access, age 55+, washer / dryer hookups and a ton of other selections. To begin, visit each property's marketing info page and select the Search Criteria that best describes its features and location. It is important to complete the search criteria for each property because this is the information the system uses to create a report of available rentals. 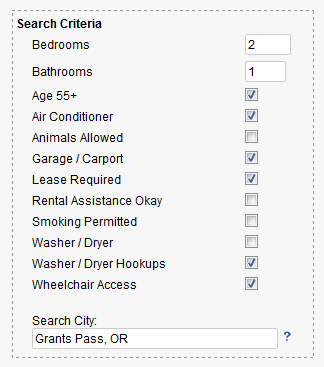 Also, visitors to your online listings page can perform their own search to find properties meeting these requirements. The end result is better matching of potential renters to their perfect rental. Visit the Reports tab and select Misc. Reports. At the top, click Available Units. You will be presented with a filtering list to show only the properties that match the items you select. To show all your properties, don't select any filters. You also have the option not to show thumbnail images, in order to list more properties on each printed page. To show all your properties, don't select any filters. You also have the option not to show thumbnail images, in order to list more properties on each printed page. You also have the option not to show thumbnail images, in order to list more properties on each printed page. 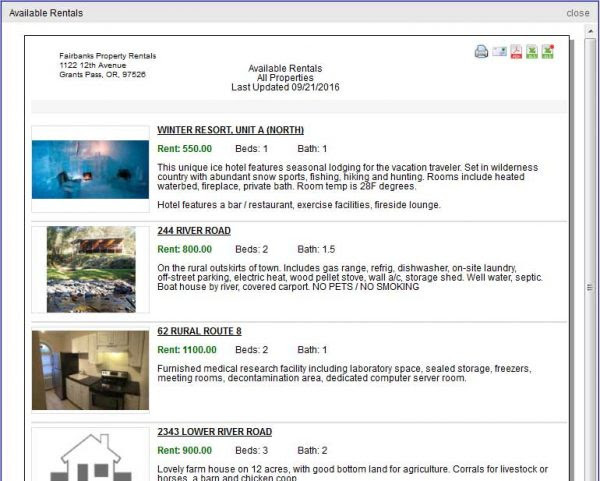 Once you have selected the specific listing criteria or choose to generate a report of all available listings, the resulting report page is suitable for printing and presenting to walk-in prospective tenants. Or, it can be emailed using the icon images in the upper right corner of the report. With improved property search criteria and a visually appealing Available Rentals Report, your renters will have a much easier time finding the property that best suits them.